In the last few months I have been testing some GPS Software in my UMPC looking for the best or at least one that could be easily used in this kind of device. 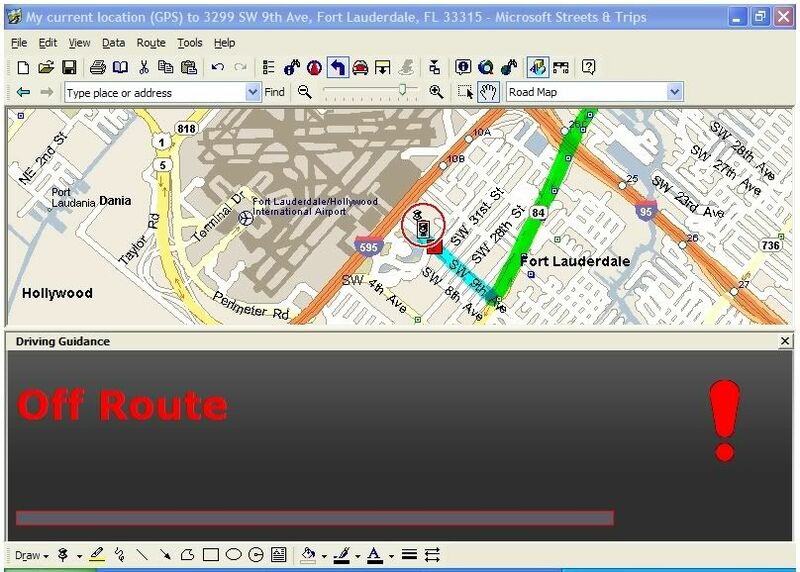 I tested Microsoft Street and Trips 2006 and it did not convinced me.It was not optimized at all to be used in a car. In another hand, simple tasks like just change the route needed to interact with multiple screens with normal side buttons that needed the stylus to click on them. In another hand, inversion 2006, there was not a full screen option so the area left for the map in the screen was too small. Microsoft changed a few thing in version 2007 but still far from being a good car companion. One thing that I did not like at all was the fact that this program did not have a 3D view. I find that the 3D view helps me a lot while I'm driving, probably is a psychological thing but I feel that by looking at that view I can have a better idea of where I'm. The above screen shot illustrates how difficult would be to change with yourfinger any option in your current route. Another point I did not like of this program is that I had to load all maps in my UMPC. That took more than 1 GB of space from my HDD. 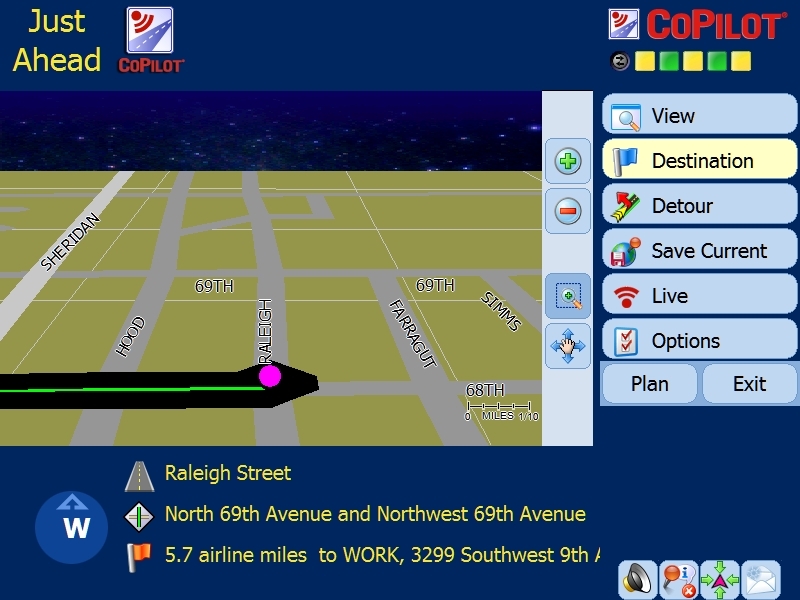 The second software that I tested was Copilot 9. This program was alot better than Microsoft's Street and Trips. Copilot was designed specially to be used in a car, so the user interface was a lot easier to use, it has big buttons so I could use it with my fingers without having to use the Stylus. One of the problems that I found with this program is that it was not designed for 800x480, I had to switch to 800x600 to used. I tested it using the USB Phillips GPS that came with the software and I found that the GPS did not work not as good as my BT TomTom GPS. Phillips GPS lost the signal very easily in one occasion that I stopped for Gas even when there was plenty of clear sky view. I have not been able to see any satellites from my bedroom with the GPS close to a windows when with my BT TomTom GPS in that same windows I can see at least 4 satellites. Another point that I did not like from Copilot is that, as you can see in the above screen shot, a big portion of the screen was used by buttons and other information and as result the space left for the map was too small. Copilot Maps have to be loaded to your HDD so that will take a big junk of it. You can check more Copilot 9 screen shots here. The first thing that I noticed in iGuidance 3 is that it gives you the option to load only those States Maps that you want into your HDD. That will save you some HDD space. The second point that impressed me was that it was designed to fit perfectly in a 800x480 resolution. As you can see from the above screen, developers managed to use the whole screen including transparent messages or areas on top of the actual map. Buttons are located too on top of the map and they have a perfect side to be used with your fingers. 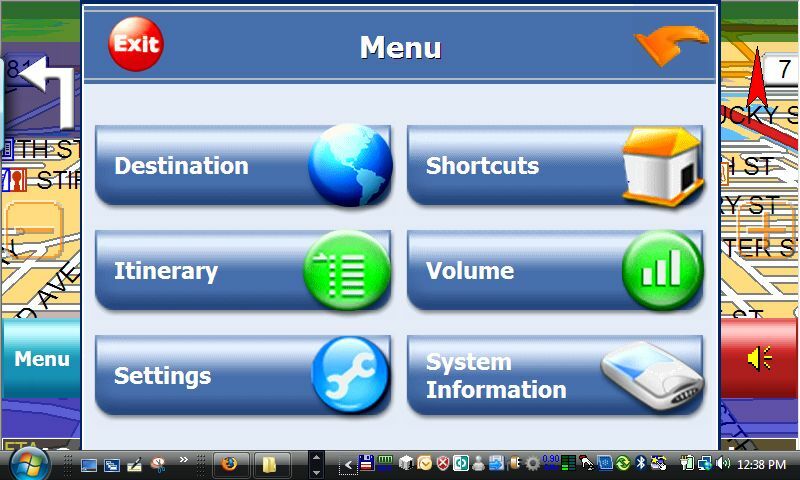 A Menu Button on the left side of the screen gives you access to all the other screens that you need to set your Destination, to select a shortcuts to point of interests, to look to your Itinerary or change the main settings of the program. Typing an address with your finger does not represent any problem in iGuidance. 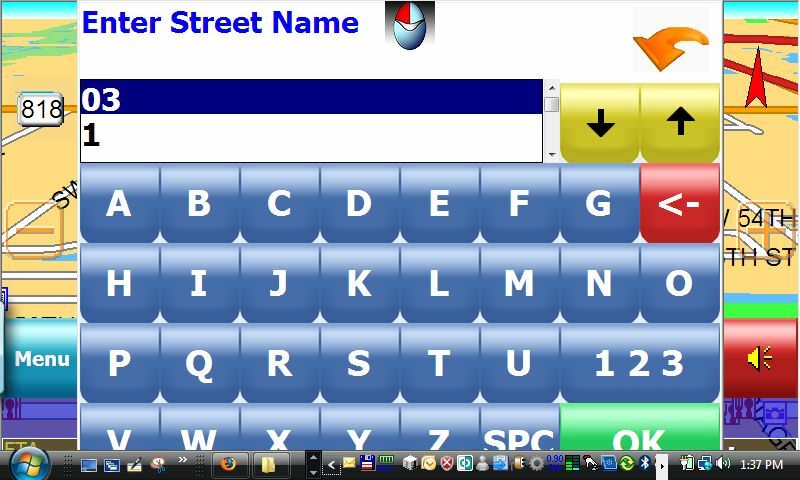 The on screen keyboard was designed to be used in that way. 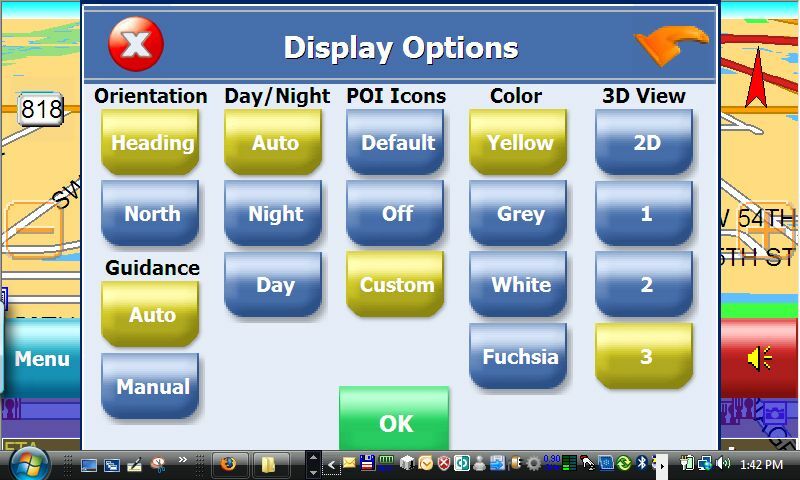 iGuidance UI was completely designed to be used while you are driving. Something completely different than in Copilot or Microsoft Street and Trips where part of the program used the normal Windows UI which is not touch friendly. 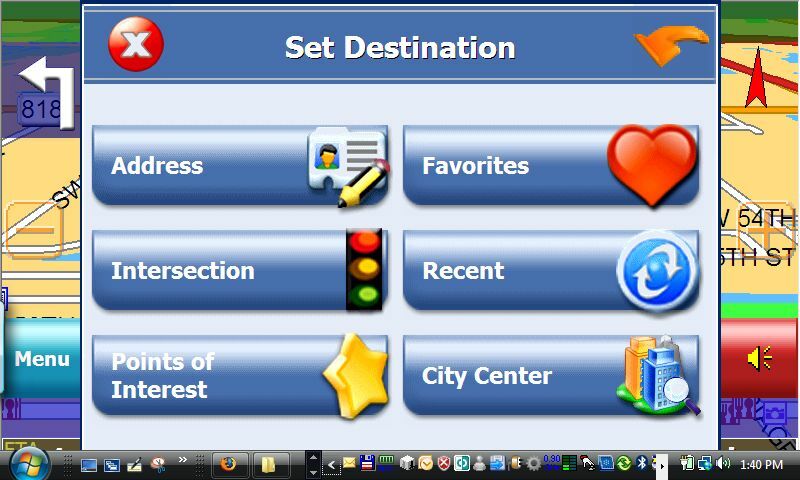 The above screen shows how easy is to change the Destination. The configuration screens in iGuidance are also very easy to use. They did not use the traditional check boxes or radio buttons; they used buttons that changed to a Gold Color to let you know what option was selected. A very clever solution. Another option that I like very much and I did not see it in any of the other two programs that I checked is the Demo option. 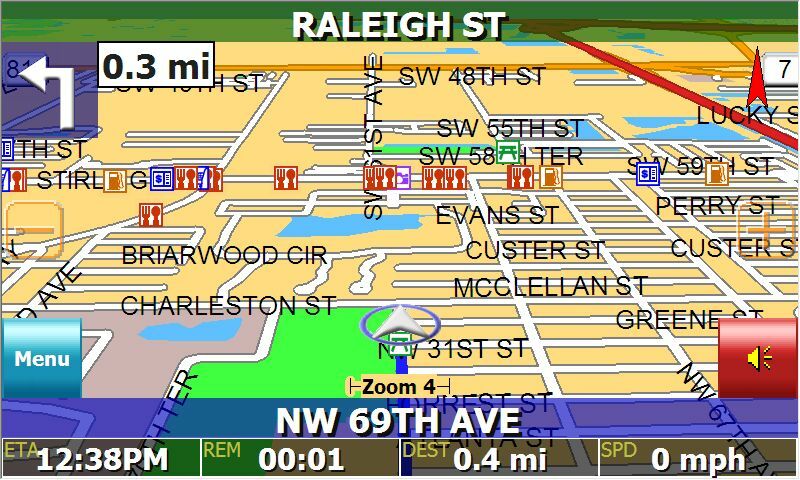 iGuidance lets you to virtually go through your route like if you were in your car connected to your GPS. The above video shows you the demo mode running and it can give you a very good idea of how this program works. The voice in this video does not feel as clear as it's in real life. Another thing that I noticed is that the arrow went out of the route in the corners, something that does not happen in real life when you are using the program connected to your GPS. iGuidance from iNav is so far the best GPS software that I have tested for UMPC. For a little more than 100 dollars you receive a DVD with versions of the program for Pocket PC, UMPC, and Laptop. If you want to have these options from Copilot you will be asked to pay for each one of them. I found Copilot to better than current version of iGuidenace in just one point, Copilot 10 includes Real Time Traffic Report if your UMPC is connected to Internet while iGuidance only includes Real Time Weather Report, of course, having Internet Connection in your Car you can have a traffic report by switching to Google Maps, a free service recently added by Google. Didn't you have any issues with abc keyb ? I found that if I type with just one finder for me is better the abc keyboard. I'm still using a ppc with Oncourse Navigator. I've been wondering which software to buy when I get around to buying a UMPC. Thanks for your comments. They will be useful. The problem with all of the above software is that there are NO maps for Australia with the exception of CoPilot. I am looking at buying that for my R2H, given that in Australia the R2H does not ship with ANY GPS software. Which basically downloads Google Maps and saves them offline..... and costs only $US20.... a damned fine price. iGuidance 3 is great. It's even better if you integrate it with CarPC frontends such as Centrafuse or Road Runner. I'm running iGuidance within Centrafuse and use an iGuidance skin that matches the skin I use for Centrafuse. I have used iGuidance in my car mounted PC since they were introduced and I love it. When running full screen mode (as you do most of the time) to exit full screen mode and return to regular windows style mode, you have to press the 'F' key. Of course UMPC's currently have no keyboard. Richard, I configured my Q1 with a hot key for Alt-Tab, that allows me to switch from the iGuidance full screen mode to any other opened application. Ctitanic, how do you configure a hot key for Alt+Tab? Thanks. We are very excited to inform you that the long awaited iGuidance v4.0 will be released during week of June 25, 2007! Please read on for product features as well as pre-order information for existing and new customers. Existing registered customers may start pre-order v4 online for $79 + s/h immediately via http://inavcorp-store.stores.yahoo.net/ignamegpssov1.html. If you haven't registered your current version of iGuidance yet, you may do so via www.inavcorp.com/registration.php (before 6/25/07) or www.inavcorp.com/myig/register.php (on or after 6/25/07). Customers who purchased iGuidance v3 from an authorized reseller on or after 3/15/07 may be eligible for free v4 upgrade exchange. More detailed info will be provided one week after v4 product launch so please stay tuned. That news was just posted today.